My buddy across the pond, Oban, turned nine years old this week. His mum made him this cake. Look closely. SEE THE SQUIRRELS???? That cake is surrounded by squirrels. No. It. Isn’t. Oh my! No wonder he’s staring at it so intently. As a terrier should! Especially when you get a cake with squirrels on it. I’ll have to speak with my peep about that…. Hey….you, too, can be a Friday’s Foto Fun. We’ll have fun with it and post it here one day! Hey…and thank you all once again for all the healing love. This entry was posted in dog photography, dogs, pets, photos of dogs, Terriers, The Scottie Chronicles. Bookmark the permalink. Happy Barkday Oban. Get those squirrels! Well that’s pne of the most fabulous birthday cakes I ever did see!! Bet he bit those squirrels’ heads RIGHT OFF! Happy Birthday, Oban. You are so well behaved in front of your cake! I hope it was delicious! Stuart, the news from the dogtor is wonderful and just what we thought it would be! Hip, hip, HORAY! Happy Birthday Oban, on the other hand, WOW the news it grand! HOORAY for you!!! We are glad that you are benign!. Cute cake. ☼ See…we just ‘knew’ your ‘bumps’ were just old silly bumps ~~~~ always good to check out for sure tho !!! Everyone needs to see a dermatologist for any ‘bump’ they have….. Happy dance, happy dance! Also happy barkday Oban! 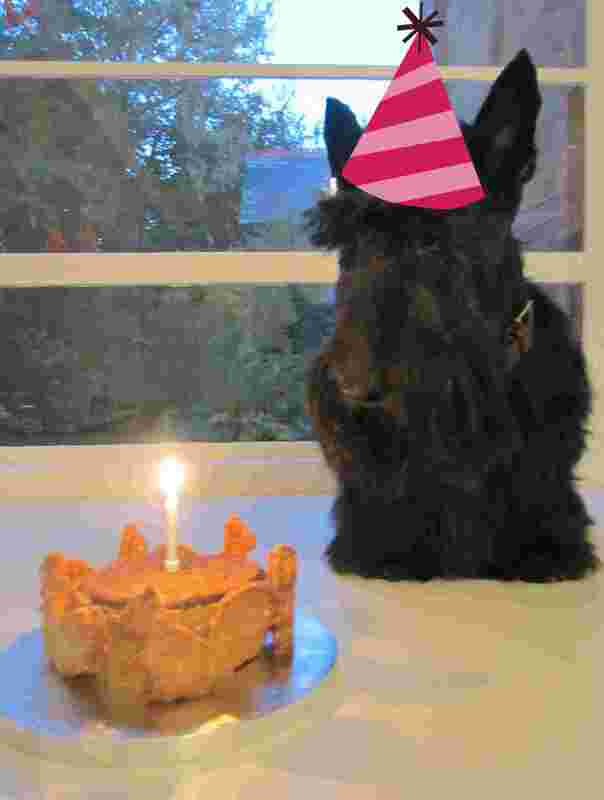 So pleased to hear Stuart’s pawsome news…well done for being Scottie Scottish Brave! I wish I could send some squirrel biscuits for you to celebrate but mum says by the time they get all the way to you they won’t taste very good :-(. Thank you to everyone for my Barkday wishes….I had lots of fun….we went for a long walk and paddled in in the river, I had steak for dinner and cake of course! Mum says I have to be healthy now and its back to lots of veggies til Santa comes!